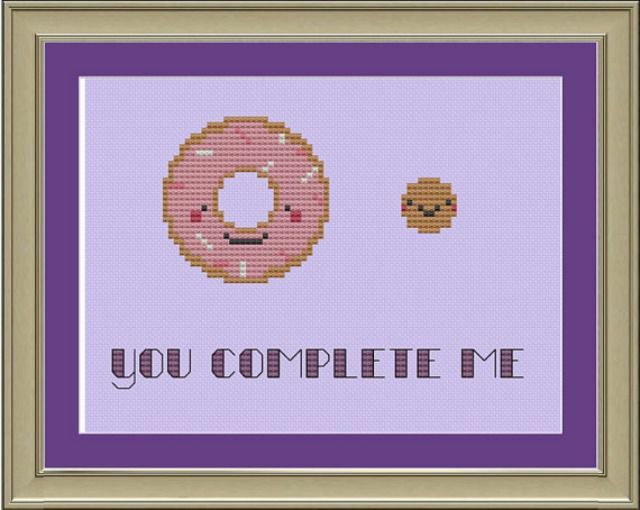 Donut inspired cross stitch, with sprinkles! June 5th is national Donut Day. Are you as excited as I am? Donut shops everywhere are giving away these tasty treats for free! Fill up your gas tank and make the donut loop around your city for your freebies. National Donut Day is more than just a nod to fried dough, it has roots deep in American history. It was created as a way to say thank you to the soldiers who served in World War I. Started by a doctor, it was later picked up by the Salvation Army. Servers of the donuts later became known as Donut Dollies by the service men. Today, let's celebrate that delectable treat that means so much to us and has been a fund raiser of organizations all over the world. Once again Nerdy Little Stitcher has created the perfect pattern. This cute little pattern is perfect for national Donut Day because donuts do complete me...complete the extra layer on my thighs! HA! Wouldn't this be a great pattern for a baker and their spouse? What a great wedding gift! You can purchase the pattern at their Etsy shop HERE. No one knows more about donuts than Homer Simpson. Say it with me..."Mmmmmm, donuts." The pattern listed is for a friendship bracelet or beads, but it can also be used as a cross stitch pattern. Have a Simpson fan in your life? Why not stitch up this pattern for them. Best part about little guy is that he, like donuts today, is free. You can download the freebie from Alpha Friendship Bracelets HERE. We all know the cliche' of cops loving donuts. I wonder where that came from? At any rate, this little pattern is perfect for the police officer with a sense of humor. Don't arrest this little guy for being so sweet. It's not his fault! I blame the sprinkles! This pattern is for purchase at the Daily Cross Stitch for only one dollar! The great thing about this site is that if you sign up for it, you get patterns free for a day and then after that, they are super cheap, like my dollar friend here. You can see this pattern as well as other quick stitches HERE. A big thanks to the man who invented National Donut Day. He knew back then that these little pieces of fried dough would become a treasure not only in the United States but all around the world. What started out as a little thank you to our troops has turned into a day of celebration with sprinkles! While you are chomping on your cruller, why not thank a soldier while you are at it.